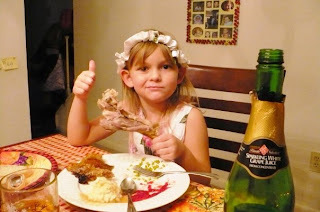 A Parent's Life to Behold, Through the Eyes of Insanity-n-Bliss...: A Cornuopia of Thoughts this Thanksgiving Holiday! A Cornuopia of Thoughts this Thanksgiving Holiday! HAPPY HAPPY HAPPY HAPPY HAPPY HAPPY HAPPY HAPPY HAPPY HAPPY HAPPY HAPPY HAPPY HAPPY HAPPY! HAAAAAAAAAAAAAAAAAAAAAAPY!!!!!! I feel incredibly thankful every year when I go and buy the bounty that will become our feast, and I actually marvel at the groceries stacked high in our kitchen. I keep thinking WOW! We are so blessed and provided for! I am about to intentionally stuff my face, and the faces of my family and friends, simply because I can! Then I am gonna lay around and perform breathing exercises in order to digest everything I consumed in 15 minutes flat. So that is the joy of the tradition of our family and many families around us; we remember the things we are thankful for and we actually all sit down at the table together to eat. I have really enjoyed reading all the status updates of friends on Facebook, who have decided to state, everyday of this month, something they are thankful for. Of course as I teach the kids the history of the pilgrims and the first Thanksgiving, I soberly realize there are many who have views that don't see it as a day to celebrate, but see the day more as an embarrassment, and tragedy, especially when the stories of Squanto and Pocahontas are taught; and really, with a maternal great-grandpa who was full Cherokee, and a paternal great-grandpa who was full Sicilian, I would say I have one foot firmly planted in both camps. When I relay these stories to my kids, I don't hide the history, but, I also add in, that without the kindness of many of the pilgrims, and the giving, kind, forgiving nature of the Native Americans, who reciprocated with grace and compassion, even when they didn't have to, there wouldn't be anything to celebrate at all. Basically for us in Modern Day America, it is a day that is carved out, where we are to rest, be with loved ones, GIVE THANKS for what we have, and it is a day that we can bless others and give to others as well. At this point that is something all should do AND celebrate! Because see I am still impacted greatly by the video I posted last year, back when I didn't really have any readers, but for a few friends and loyal cyberpals. So yep. I'm posting it. Again. Yes. I really want my kids to understand how blessed they are, and how important it is to serve and love others. I am hoping every year our Holiday Season will more and more be a time where we experience giving to others around us who don't have what we have. And I want to partner that with fun family traditions and activities that strengthen and celebrate our family bond. We have found ways to serve as a family and I am always blown away at how hard my kids work and how much they value the act of service and, that at their young age they know this makes a positive impact on the world around them. Plus when they are having a totally selfish moment, or when I am having a totally selfish moment, those experiences are blaring reminders that we need serious attitude adjustments. This.compels.me. I can't watch it without crying, and at the same time being thankful I can go do something about it! And this year, they have a follow-up video! This lifts my heart ya'all! Whatever people do, big or small, it always points to the real reason for the season! Please share with me the things you and your family do this time of year, serving in your communities and beyond, and if you haven't added this tradition of serving to your families yet, take the time to consider how you can bless others during this Holiday Season! Peace out ya'all and have a great weekend!! Wow! you gave me alot to think about. I am very grateful for my health right now. It could be worse. just look at that blogger, Anissa..her family, her three kids, I am totally praying for her AND her family at this time. MY family has their good health, we do have a regular paycheck coming in, and we have a full pantry. And clothes in our closet. AND the freedom to worship how we may. Oh we are a blessed ppl. Plus there is Twitter. I am so grateful for Twitter. I think I need to find you on Twitter. I don't think I have found U yet. Have a Happy Thanksgiving Kim. Glad I met you in this ole bloggy world. that was long. also. you gave me permayersion to skip. but i didn't. not fully. i skimmed. also. i just used your name. man. i'm good. now i just need to work in the others. i also need to work on community servarce. giving back. i need to varlunteer. i watched this vedeo last year. i think. i could watch it again. just to make sure. mayerbe. happy thanksgiving. you're the beef. I love that first picture. 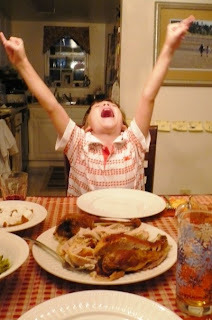 That's just how I feel when I get to the dessert table. Thanksgiving is my favorite holiday too. For all the same reasons mostly being with family and friends, and the only things we have to do are eat (all the most awesome comfort food you possibly can for days on end) and be thankful for what we have. I wish you peace and plates of comfort food....oh and tons of leftovers! Kimmy I love you. Or lave you now......whichever you want. I love you and lave you. You are the sweetest and one of the most inspiring people i know. *sap* Loved the pics! That picture of your daughter and the humongoid turkey leg? My fave, by far.